Baikal is what I am reminded of whenever I see the Sadpara Lake, situated at a short drive (an easy walk) south of Skardu. The walk along the torrent is more pleasant and shorter than following the jeep road. The lake surrounded by bare mountains abounds in fish, and is an ideal place just to sit there and think of fairies. Who wants to fish anyway?! A meditating Buddha carved on the northern face of a large rock about half way between Skardu and Sadpara is of interest mostly for the foreign tourists. It is off the road across the Sadpara stream: cross a footbridge over the stream and up to the slope on the other side at Manthal. The Buddha, carved on a big rust brown rock, perhaps in the 7th century, is the same style as one at Kargha near Gilgit. The Deosai Plateau, known as the highest plateau in the world, is located at the boundary of the Karakoram and the western Himalayas. Deosai Plains are a backwoods country at about 30 kilometres from Skardu. It is a beautiful summer pasture with greenery and countless species of Fiona flora. The view of the Karakorum Range from the top of the 4785 meter pass is legendary. Apart from fairies, this plateau is the habitat of the greatly threatened Himalayan Brown Bear and many other wild animals. Although few people will see a bear, quite a few are said to make their homes in the heart of the plateau. At an average elevation of 3500 meters, Deosai officially is a National Park and protected area for wildlife. The undulating meadows here have no trees or shrubs and the area is snow covered for most of the year. Spring comes to Deosai late, when millions of wild flowers begin to bloom all over the lush green grassland. This is a time when Deosai looks like a fairie’s land, with a landscape full of wild flowers on green rolling hills and crystal clear water streams with snow-covered peaks in the background. That is the season when most travellers go to the area. On my way to Gunma, at Deosai, army men break their journey at Sheosar Lake. This place offers beautiful views of distant peaks and a panoramic view of Deosai Plains. At Bara Pani, one may spend hours in a hope to watch a bear or you may enjoy fishing in the cold waters of Barwai Stream. From Deosai, you can travel back via Skardu and Gilgit to enjoy the most thrilling drive along the Indus River, or continue to Gunma if you have to. The Deosai Plains is interlaced with streams, a large brown bear population, and multitude of golden marmots. Its remarkable biodiversity has recently earned it recognition as a national wilderness park. Its brief summer brings out intense July-August mosquito swarms, which are relieved by strong daytime winds. Early September frosts restore peace to the plateau, making trekking pleasurable. A jeep track crosses the Deosai between Skardu and the Astor Valley. From Skardu, the road heads south up the Sadpara Valley, passing Sadpara Lake and a small sleepy village. 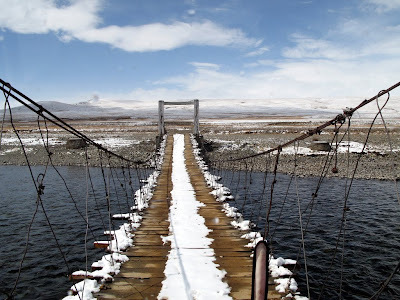 It continues west across the Deosai plateau, crossing large clear streams via bridges. As it leaves Deosai, it skirts the northern shore of another charming lake, and then crosses the Pass (4266 meters) to the upper Astor Valley. A careful observation has shown that an amazing number of alpine plants are living under the extremely severe conditions of this area. This is a meeting place for three types of plants of Japanese and Chinese origin, Central Asian origin and Mediterranean origin. Variegated plant species also grow in harmony. The area is surrounded by snowy mountains exceeding 5,000 meters in height and suspended glaciers. In June, one can see full blooms of purple meadow cranesbill (geranium pratense), which cover all the slopes, mauve flowers of eritrichium sp: the densely tufted knotweed (bistorta affinis) in a sheet of dark red flowers, a line of yellow flowers of pedicularis and many more in thick clumps. The rock anemone, paraquilegia microphylla, grows in rocky crevices skilfully utilizing exuded water and taking advantage of the protection from strong winds and cold. Its cup-shaped flowers of bluish white with yellow centre bloom all together. The neat and clean pure white saxifrage sibirica also blooms at this time of year, while the pretty white-fringed flowers of the alpine campion (silence moorcroftiana) bloom secretly in the shadow of rocks. Pseudosedium condensatum, a rare alpine planet, displays pink flowers like a royal crown in a shrub of ephedra. Large groups of pseudomertensis motikoides exhibit bright blue flowers, while other alpine flowers noted in the pasture at Dalsangpa include the large golden-yellow flowers of inula grandiflora, reminding some of sunflowers, the dark purple flowers of lindelofia stylosa, pretty yellow poppies, and the red flowers of the Himalayan stonecrop. The most enchanting feature of the Deosai Plateau is its huge field of alpine flowers, the scale of which is largest in the Karakoram and the Western Himalayas. You can look out on an endless scene of alpine flowers as far as the eye can see — the gently rolling hills are carpeted in large part by the purple flowers of adenocaryum anchusoides, or the reddish-purple flowers of the long tube louse-word (pedicularis siphonantha). The mauve flowers of Aster carpet a wide area, and two kinds of primroses with pink and red blooms can be found growing in large clumps. Flannel mulmein (verbascum thapsus) and pedicularis bicornuta, both yellow in colour, stand tall on the plateau. Natives will often present you with a goodwill bundle of Horros flowers, which produce so much aroma they will intoxicate anyone. It is an unforgettable experience to be in this colour bonanza in the full bloom. The peaceful atmosphere of the night, completely devoid of synthetic noise, being broken only by the sounds of rolling stones and falling ice. For a layman, alpine plants in Deosai are simply too numerous to mention. The colourful plateau is changed to a burning yellow carpet in autumn under a clear sky. There are many places suitable for summer camping: on the bed of edelweiss or at the riverside or lakeside. Chakor Pass (4,266 meters), located at the south end of the plateau, is the most impressive part of the Deosai trip. The deep blue Shaucer Lake, nestled in the pass, offers picture-book scenery. The view looking northward is of the endless series of peaks of the Karakorum Range. For adventure-loving tourists, there are few paradises in the world that can compare to northern Pakistan for unspoiled natural beauty: a combination of soaring mountains, shimmering glaciers, crystal clear water streams and flower bedecked alpine pastures. In addition, the gentle, warm and hospitable character of the villagers makes your trip to this part of the world a fantastic and unforgettable memory of a lifetime. I have a Great urge to go to the Deosai Plains. An Amazing place to visit ! I can see why there might be fairies there! I looks like a magical place to visit. You are welcome Rose. And you have a standing invitation. Excellent! Shirazi you took me along on the jouney. It brought back all the memories of the area. I cherish those lovely memories and love the place. As somebody said fairies are there. Look around and you will find them around and beside you.